If you follow me on Instagram, then you saw my Grandma Rae's Thanksgiving table a few weeks ago. She has been cooking Thanksgiving dinner my entire life, and to be honest, I feel a bit cheated when I don't get to experience her food on Thanksgiving. She's an amazing cook, and I know why my mom loves to cook, and now why I love to cook as well. This recipe of hers takes me back many years. I've always loved it, and I finally got the recipe from my grandma this year when we were at her house for Thanksgiving. 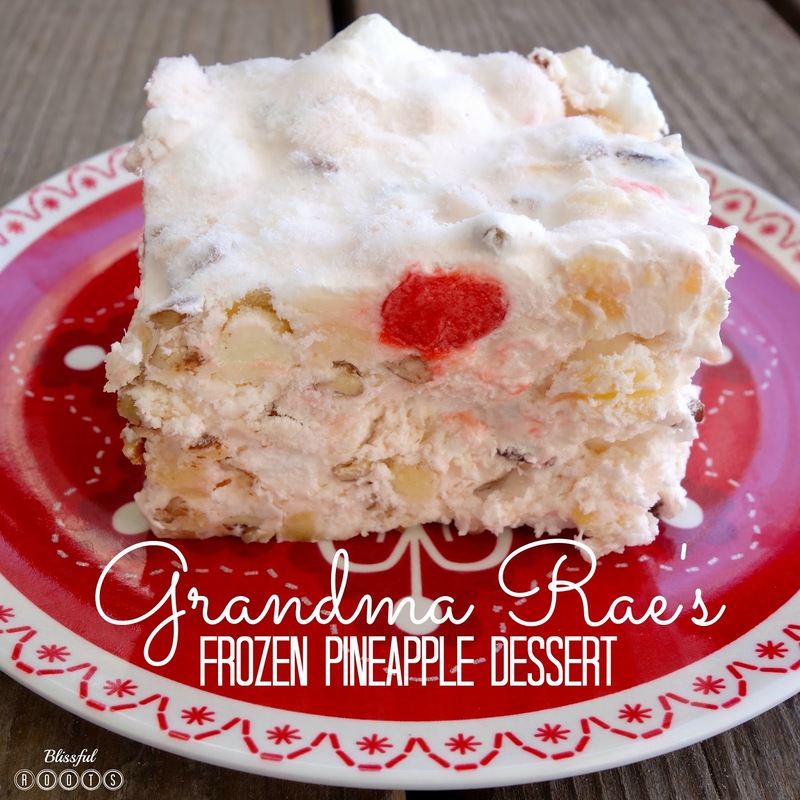 maraschino cherries (which I usually don't care for) in this dessert, but I think my favorite part is that it's frozen. You'll freeze it over night, and then let it thaw for half an hour or so before you serve it. Delicious! 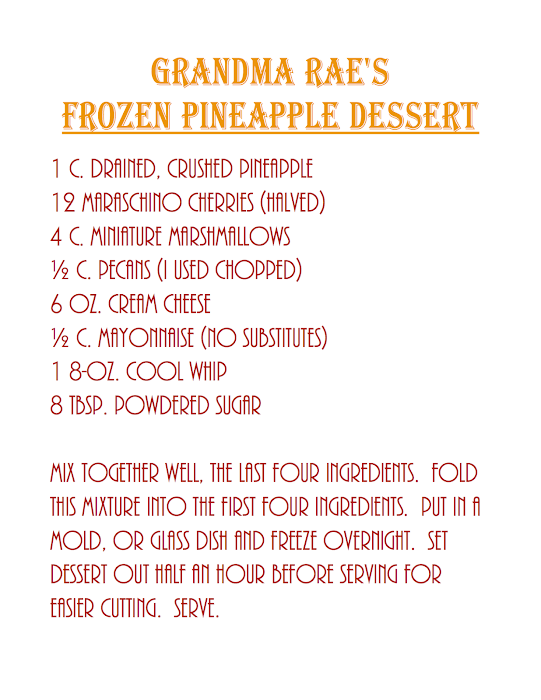 I'd never seen this recipe written out until last month, and I realized it is a dessert. We've always had it a a fruit salad side dish with our meals, but it is sweet enough to be a dessert. Use it whichever way you'd like. I have to add one more note about my wonderful grandma and this recipe. She told me the original recipe called for 24 large marshmallows, but she likes the mini marshmallows better. To figure out how many mini marshmallows would be equal to one large marshmallows, she stacked mini marshmallows to look about the size of the large ones. Each large marshmallow equaled 10 mini marshmallows. That makes 240 marshmallows in all. My grandma counts all 240 mini marshmallows when she makes this dessert! I did count them out the first time I made the dessert, but then measured the 240 marshmallows to be approximately 4 cups worth. I do wish I had the patience my grandma has! The white and pops of red from the maraschino cherries make this the perfect Christmas dish. Thank you for the delicious recipe, Grandma Rae. Hopefully I'll be making it for my grand kids someday!